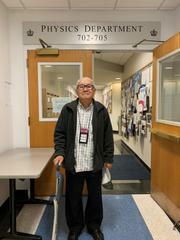 Edward Ng was last seen at his residence in South Pasadena at about 1:00 pm on Dec 13, 2018. It is believed he took a ride share service to the area around the LA County Medical Center. Mr. Ng has a cell phone, but it appears to be turned off. He had medical problems and may be in need of medication. He was last seen wearing an unknown color shirt and dress slacks. If you have any information on Mr. Ng's whereabouts, please call SPPD at 626-403-7265.